This holiday season, for the second consecutive year, Pipitone Group (PG) has partnered with its client Ursuline Support Services to provide gifts for local seniors in need. Ursuline Support Services works with agencies and facilities in the Pittsburgh area to support and care for the elderly, many of whom lack a close support system of friends and family. This year, PG’s efforts take the form of a “Gifting Tree,” located in PG’s account services department. Each leaf on the tree represents a senior in need. 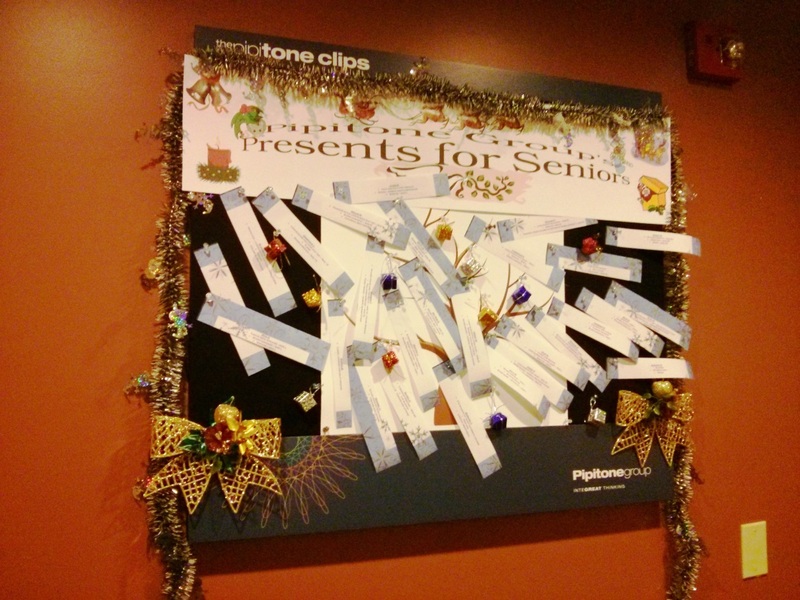 Employees may pick off a leaf and purchase a holiday gift from that senior’s wish list. The gifts will be distributed prior to the Christmas holiday. Last year, PG provided over 30 gifts to seniors residing in local assisted living communities. In past years, PG has partnered with organizations such as Toys for Tots and the Northside Common Ministries Food Pantry to help those in need during the season of giving. Click here to learn more about Ursuline Support Services, including how you can make a difference yourself.